Luc-Olivier Merson (May 21, 1846-November 13, 1920) was a French academic painter and illustrator also known for his postage stamp and currency designs. Born Nicolas Luc-Olivier Merson in Paris, France, he grew up in an artistic household, the son of Charles-Olivier Merson, a painter and art critic. He studied under Gustave Chassevent at the Ecole de Dessin and then Isidore Pils at the Ecole des Beaux-Arts. 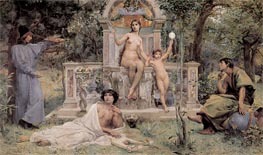 Merson had his first work exhibited at the Paris Salon in 1866 and three years later was awarded the Prix de Rome. 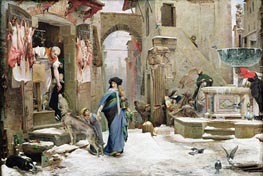 During the five years spent working in Italy, he concentrated on religious and historical subjects for his art. Back in France, in 1875 he won the first-prize medal at the exhibition by the Societe des artistes francais. 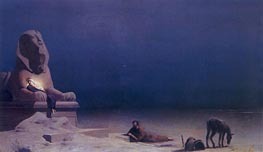 "Notre-Dame de Paris," one of Merson's best known paintings that was created as a result of the huge popularity of the Victor Hugo novel of the same name. 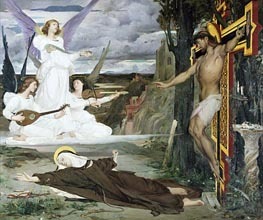 An 1881 work, with its mystical Gothic images, its style reflects the influence of the then evolving Symbolist movement. Merson's art became a vehicle for decorative commissions, doing major works for such institutions as the famous Palais de Justice (Courthouse), the Louis Pasteur Museum, and the mosaic in the chancel vault in the Basilica of the Sacre C?ur. He also did the artwork for stained glass windows, an example of which can be found in the Church of the Holy Trinity Rittenhouse Square in Philadelphia, Pennsylvania. 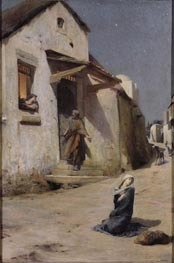 His profile was raised considerably after being awarded a gold medal for his painting at the 1889 Exposition Universelle, and in 1892 he was elected to the Academie des beaux-arts. By 1900 Merson was designing postage stamps for the French post and the Monaco post. By 1908 he had been contracted by the Bank of France to create a number of designs for some of the country's banknotes. 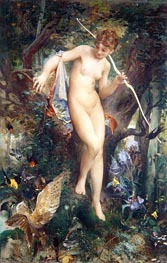 Between 1906 and 1911, Luc-Olivier Merson taught at the Ecole des Beaux-Arts. In recognition of his contribution to French culture, Luc-Olivier Merson was awarded the Legion of Honor. Luc-Olivier Merson died in Paris in 1920, his work largely forgotten as a result of the overwhelming popularity of the avant-garde art forms as seen in the works of the Impressionists and other artists movements.